Since New York City has so few alleys, I tend to be fascinated by them when encountering one. Even better is an alley that has some notable history attached to it. 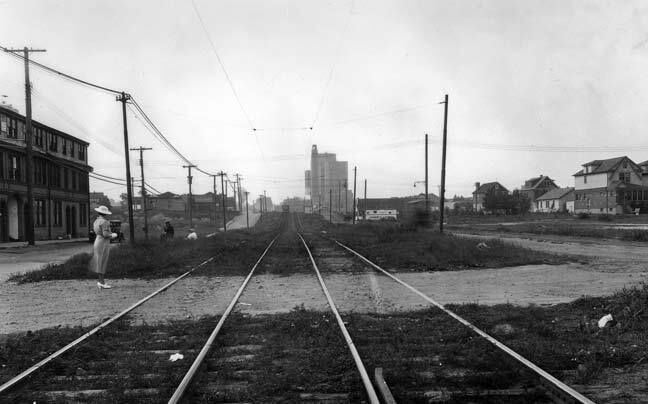 In the late 19th and early 20th Century, a trolley line connected Flushing and Jamaica, running originally through the farms and fields of Fresh Meadows. The above image was captured at 164th Street and 77th Avenue in 1936, just a few months before service ended in 1937. In short order, the tracks were pulled up, the weeds paved over, a center median added, and 164th Street became the fast and furious stretch we know it as today between Flushing Cemetery and the Grand Central Parkway. More images of this ilk can be found in the book I wrote in association with the Greater Astoria Historical Society, Forgotten Queens. South of Grand Central Parkway the trolley line veered off 164th and rode on its own right of way to a terminal on Jamaica Avenue at about 160th Street. In the decades since, most of this trolley route has been either eliminated or hidden pretty well, but one remnant, a dead-end alley named Burdette Place, is still there on 89th Avenue just west of Parsons Boulevard. It’s doubtful the name has anything to do with 1950s-1960s Milwaukee Braves pitching immortal Lew Burdette. If you explore it, as few who don’t live on it will bother to do, it’s not bad at all, with attached and freestanding buildings. 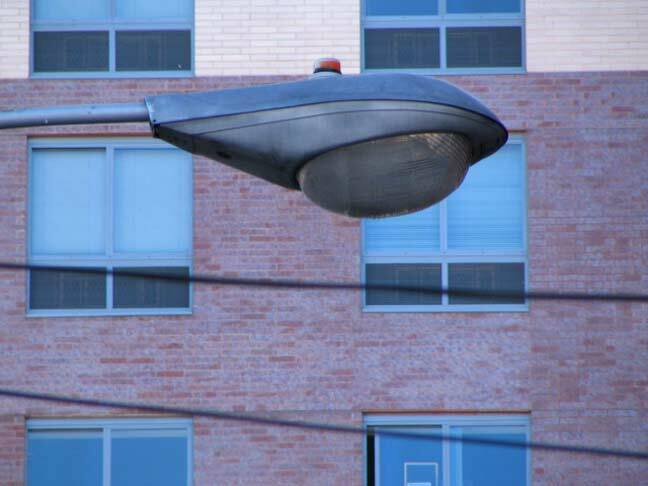 For me, of course, the attraction is the presence of a remaining 1960- vintage General Electric M-400 luminaire. Along with their Westinghouse Silverliner compadres, these once lit 95% of New York City streets between 1960 and 1972, when the new bright yellow sodium lights arrived. The M400s burn a rather dull greenish-white, and Burdette Place may be pretty forbidding at night. In the same vein, you might be interested in a video to be found over at the SubChat web site. Someone followed the abandoned route of the LIRR Evergreen branch, as it is now — through backyards, parking lots, even a grocery store. A labor of love, and fascinating to watch. 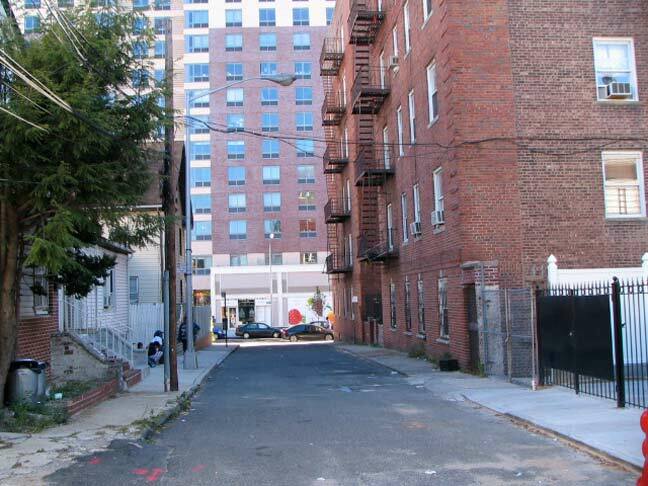 there is a similar but un-named alley off of 89 Avenue between 146 Street and Sutphin Boulevard. Google maps shows it as “Driveway Drive”. There’s another nearby existing alley which appears to be part of this former trolley right of way. It is the alley called Glenn Avenue located at 85th Avenue and 164th Street, where the original 164th Street (Flushing-Jamaica) trolley veered off 164th Street (as you mentioned), and traveled in a private right of way between Normal Road and 86th Avenue, crossing Parsons Blvd. at 87th Avenue and 155th Street, where it followed an exension of the Burdette Place right of way running southbound along 155th Street and Burdette Place. 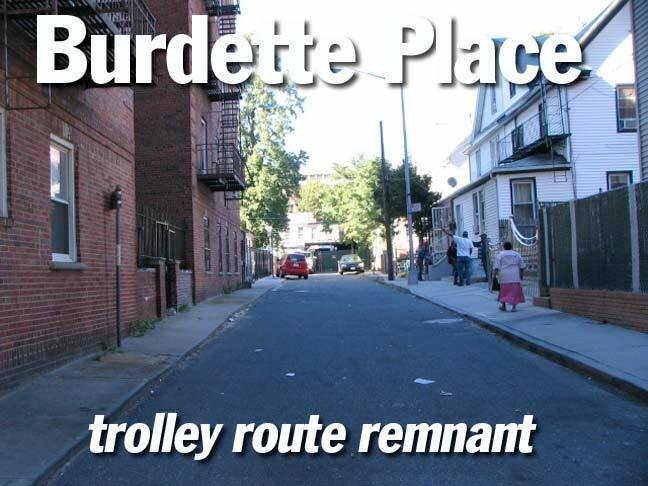 It appears that in later years when the trolley was removed and the area was further subdivided and built up, that Burdette Place and 155th Street no longer were connected and probably obtained their separate names. In a satellite and street view of Google Map, there indicates that there is some sort of path or drive between Parsons Blvd. (where it is gated) and runs northeast bound to the end of Glenn Place (with double dashed lines on the map along the old dedicated right of way between those points). What were the odds that both you and I would see this feature. I’m doing research for the 2015 Jamaica High School Reunion and my eyeballs lit up like a pin ball machine at the 165th Street bus terminal when I saw this. I haven’t spoken to your brother in a couple of years, but, I immediately sent him the link. I saw his reply this morning, wherein he mentioned your post. I browsed over to the site, and, sure enough, there was your post. Completely accurate. The synchronicity of the universe. Hope all is well and check out the 2015 Jamaica High School Reunion page on facebook. Have you seen the behemoth building built onto the old main branch of the Queensboro Public Library on Parsons and 89th Ave? It extends down 89th Ave. and past 153-15 89th Ave.
Aside from (my daily dose of) synchronicity (you’d never believe it! ), I have been seaching for someone who remembers a store called Lind’s or Lynn’s near the bus terminal. I used to go to May’s and the Valencia with my mom in the sixties, and remember eating one of those nice hot salted pretzels and moseying up to Lind’s before we returned to the IND subway. I sure hope that you or Daniel recalls that place, because no one on here has responded despite a few queries. Thanks for any consideration, and may the guardians of the reality levels remain with you. I do remember the store. Think it was called Lynn’s. I was never in the establishment but believe it was a discount operation. I’m quite familiar with Burdette Place as well. I remember Richard and Daniel and the many other kids who lived in the 153-15 building. We lived on the fifth floor in an apartment facing the alley. The neighborhood and building were quite nice in the 50’s and early sixties. Most of the kids in the building (there were 5 or 6 of us about the same age) attended PS 170. Some of the Catholic children were students at the nearby Presentation of the Virgin Mary school on Parsons Boulevard. We all played stickball on Burdette Place. 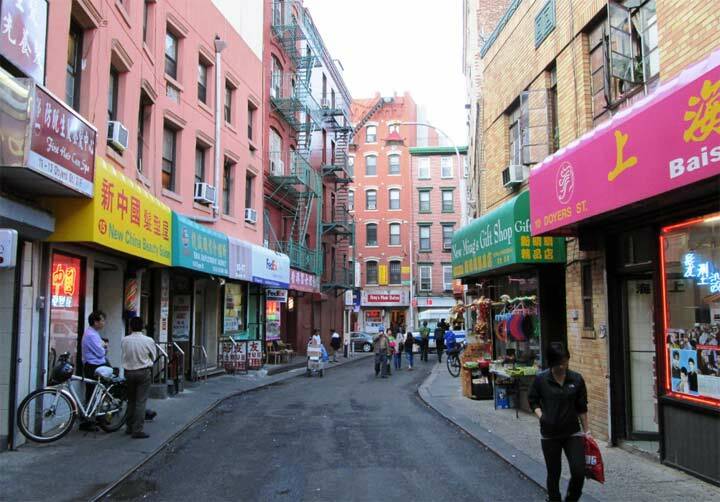 The street was very narrow and the rubber balls were always getting stuck on the fire escapes or up in the junkyard. Nearby Rufus King park was the preferred location for baseball and chestnut throwing. I understand the main field in the park is now an artificial turf soccer field. I left the neighborhood after college and now live in the South, but my mother continued to live in the building until 2012. She witnessed many changes to Burdette Place and the surrounding neighborhood. As a pre-kindergartner, pre WW2 my aunties would treat me to a ride College Point Ferry to Jamaica, past Flushing Airport, up Main St. eventually on Franconia Avenue (45th Ave), down 22d (162d) street to Flushing Cemetery (in an earlier age, this stop for the Germans of College Point to a nearby beer garden) further past Kissena Park and Mt St Mary’s Cemetery on thru the cutoff thru the bush eventually to Parsons Blvd. Trolleys were orange as were their sucessor busses (the Q-65). 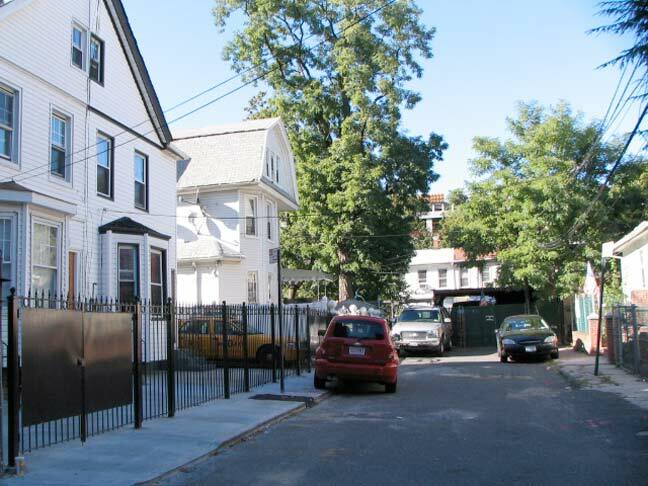 I was born in Mary Immaculate in 1940 and we lived in the second floor apartment with the window and fire escape you can see on the far side of the courtyard in the first picture of 153-15 from what we then called ‘the side street’. Maybe that was before it was named “Burdette Place.” I went to PS 170 from kindergarten to eighth grade and still remember Mrs. Truman, Mrs. Bernard, Mr. Greenberg and others, especially Mrs. Donough! We moved from there in 1954. I remember playing pretend The Lone Ranger, Tom Mix, Roy Rodgers, etc., in the back courtyard, the two German Shepards barking at all hours in the house on the corner, and so much more, My closest buddies were Harvey, Jimmy and Neil? Anybody else still remember those days? I, too, remember the rag man with his horse and wagon, the knife sharpener, the candy store on the corner of Parsons, and so much more.